We’re excited this week to talk about our Organic Carrot Seed Oil benefits and uses. Carrot Seed oil is a yellow or amber colored to pale orange brown liquid of peculiar dry woody, somewhat root like, earthy odor. The initial notes are sweet and fresh, but the tenacious undertone and dryout is very heavy, earthy, fatty oily, slightly spicy. 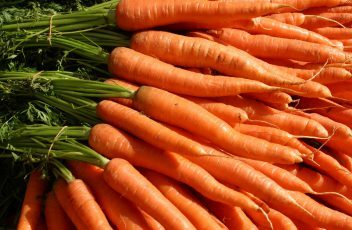 Carrot was better known for its edible root than its essential oil. Carrot was of great medicinal value in the ancient world and the name stems from the Greek ‘Carotos’. Recognized for its carminative properties, it has grown in popularity since the 16th century. It also gained a reputation for dealing with skin diseases. B-Myrcene 0.4-1.3%, (Z)-x-Bergamotene 0 – 1.1%, B-Selinene 0-1.1%. This oil contains large amount of terpenes, particularly monoterpenes. Carminative, cytophylactic, depurative, diuretic, emmenagogue, hepatic, stimulant, tonic, vermifuge. Carrot Seed Essential Oil is said to have a cleansing effect on the mind. It may help to relieve feelings of stress and exhaustion. This oil is an excellent purifier of the body, mainly due to its detoxifying effect on the liver when used in massage oils and baths. In skin care, this is an excellent oil to improve the complexion due to its strengthening effect on red blood cells, adding tone and elasticity to the skin. It apparently gives a more “youthful” appearance and it is said to remove “age spots.” Carrot Seed Essential Oil is also said to alleviate other problems such as weeping sores and ulcers. Generally healing to inflamed wounds as well as dry and hard skin, callouses and corns. Further, it vitalizes the hydpodermis and is recommended for the treatment of aged skin, dermatitis, skin rashes and wrinkles. In Perfumery, Carrot Seed Oil is used for its fatty woody notes which blend well with Cypress, Citrus oils, Costus Oil, Cassia, Mimosa, Geranium oils, and Cedarwood derivatives. We like to blend it with Bergamot, Fennel, Juniper, Lavender, Lemon, Lime, Melissa, Neroli, Orange, Petitgrain, Rosemary. For the next week, until 3/22/2017, SunRose Aromatics is offering a 10% discount on this oil from our Rare & Exotic Collection, which is rarely discounted. Use coupon code CARROTA to save 10% on retail sizes of our Organic Carrot Seed Essential Oil. We hope you’ll give this lovely material a try! Hazards: May interfere with gestation. Contraindications (all routes): Pregnancy, breastfeeding. Regulatory guidelines: Has GRAS status. Do NOT use undiluted on the skin. Arctander S.. Perfume and flavor materials of natural origin. These yummy mushrooms grow on my brother’s property upstate Kent, NY. My brother calls this picture :: ‘The three amigos’ for obvious reasons. (Yellow Morel – Morchella esculenta). He made them for me .. just a little butter, salt & pepper .. mouth watering.! The second picture is a favorite dish from our childhood .. that my Grandma would cook for us. We called it .. ‘tomato’s and eggs’ though aka eggs in purgatory’, this was a dish during the depression era. Saute some fresh garlic in olive oil, chop up the tomatoes, salt, pepper, fresh basil .. add the eggs , oh boy.!! Those were bottled tomatoes and fresh herbs from the garden. Yum! Did you know the label “100 Percent Natural” has different meanings for chicken fingers, cookies and various other foods? Or that those “cage-free” chickens might not ever have seen the outdoors? Here’s a guide to help sort out what’s meaningful, what’s dubious — and what’s total fluff. One of my dearest and oldest friend Kat just put up June 2008 ‘Rock Tarot’ readings, a fun and insightful site I think you would enjoy. To visit her page click on: RockReadings. enjoy the many blessing in our lives. For me, its enjoying my garden. Remember .. to protect your skin, and stay hydrated.! And don’t forget our furry friends, they need plenty of water as well. The new and improved SunRose site is still working out some ‘bugs’ , so please, if you are experiencing any problems, please write me so that we can fit it right quick.! I hope your garden is growing and thriving !